Jerry Leon Rice, age 65 was born on January 24, 1953, in Sallisaw, OK, to the late Leon and Beatrice (Bell) Rice. He went to his heavenly home on Saturday, October 06, at his Oklahoma City residence. He was raised in Poteau, OK. He graduated Poteau High School in 1971. From there he attended Hillsdale Free Will Baptist College in Moore, OK, now Randall University. He married the love of his life the late Marjorie Mae Rice on August 4, 1972, at the First Free Will Baptist Church in McAlester, OK. They lived in the Oklahoma City area for the first year and a half and then moved and spent the majority of their marriage in Mustang area. He worked construction for Adams Construction, until he was able to be hired on full-time at Mustang Fire Department in 1975. He retired after 31 years of service as training officer and held the rank of Major. 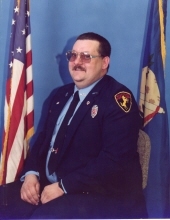 He also worked as an Instructor for Oklahoma State University with the Fire Service program a total of almost 20 years. Besides Mustang Fire Department, he also served as Training Officer for other departments, including Union City and Minco Fire Department. He was an officer for the FSIO organization for many years. He also helped establish the Clear Springs Free Will Baptist Church where he served as Deacon. He was devoted to his family and served his community and church to fullest of his ability. He is preceded in death by his loving wife, Marjorie, his mother and father Leon and Beatrice, brother in law, Don Adams, both sets of grandparents, mother in law, Clariece Christian, and a nephew, Christopher Odle. He is survived by his daughters, Jodi Gardner and husband Dustin of Oklahoma City, OK, Marissa Davis and husband Marvin of Mustang, OK; grandchildren Braylee and Emalee Gardner of Oklahoma City, Gabriel and Madison Davis of Mustang, OK; father in law, Charles J. Christian of McAlester, OK, sister, Linda Skinner and husband Garry of Poteau, OK; sister in law Nancy Weddle and husband Don of Tulsa, OK, brother in law Paul Odle and wife Joyce of Olathe, KS; numerous nieces and nephews and extended family and friends. Also, his fur babies Maisy and Missie whom he loved so much. The family wishes to say a special thank you to Tender Care Hospice for their show of love and support. Funeral Services will be 10:00am Wednesday, October 10, 2018 at Clear Springs Freewill Baptist Church, Mustang, Oklahoma with burial to follow at the Mustang Cemetery, Mustang, Oklahoma. To send flowers or a remembrance gift to the family of Jerry Leon Rice, please visit our Tribute Store. 921 N. Clear Springs Rd. "Email Address" would like to share the life celebration of Jerry Leon Rice. Click on the "link" to go to share a favorite memory or leave a condolence message for the family.